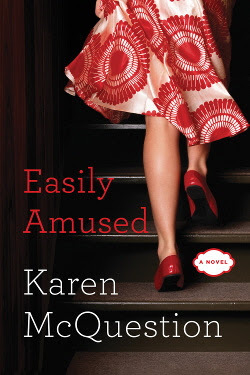 Easily Amused was written by Karen McQuestion. When I read Scattered Life and added it to my book list I said I liked it, but not enough to rush off and find another book by Karen McQuestion. That statement was absolutely true... and I have to admit that when I download Easily Amused to my kindle it was because it was on a list of low price ebooks and sounded worth the read. I realized it was the same author after I started reading. Oops. I think I feel the same way about this story as I did about the first. It was an enjoyable read. Lola, the main character, was interesting enough. I very easily disliked Lola's sister as much as she did herself. Hubert (Lola's friend) was a lovable guy. Ryan Moriarty (the mysterious neighbor) keeps you guessing. But again... I'm not in a rush to buy another of Karen McQuestion's novels. I guess they're just not my favorite type of books.